This includes full set up of our extra large zorbing pool and provision of 3 zorbs. The pool needs to be set up and left overnight to fill with water so it must be at a secure location. We will give a full safety briefing, demonstration and instructions on how to operate the zorbs. Two responsible adults must be present at all times the zorbs are in use and must remain sober. 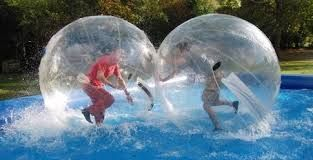 Hire your local leisure centre and we will bring the water zorbs to you there! Includes 1 member of staff to operate the zorbs. This includes full set up of our extra large zorbing pool and provision of 4 zorbs and one member of staff to operate them for 4 hours. An additional adult must be present to assist. The pool needs to be set up and left overnight to fill with water so it must be at a secure location. This includes full set up of our extra large zorbing pool and provision of 4 zorbs and two members of staff for up to 4 hours. This is the ideal set up for events. The pool usually needs to be set up and left overnight to fill with water so it must be at a secure location.